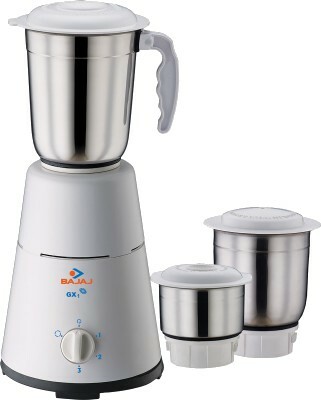 Best time to buy Bajaj GX 1 Mixer Grinder which comes with 3 Jars in black and white color. You or your mom can used this Mixer grinder as Juicer or Chuttney making purposes. Market price for Bajaj GX 1 mixer grinder is 3595 Rs, but with this special flipkart discount, you can buy this awesome Bajaj mixer grinder in just 1699 Price and can avail 52% discount. 1699 is the lowest price deal online for a Branded mixer grinder and juicer. I hope you like this Flipkarts Mixer Grinder deal, for more awesome deals, discounts and offers, stay connected with All India Coupons.